If you could choose just one of the cupcakes above, which would you choose? B. Both grouchy old men. Their cupcakes look smaller than the others so I should get both (You are in denial on portion sizes and have entitlement issues. Step away from the cupcakes and seek help). D. They are adorable but I have an addiction to sugar so no thank you. (You are my hero today). Just because something is visually appealing and damn cute does not mean I can/should/must eat it. I have often regretted eating things that appealed to my vision but where not so appealing in my mouth. (I hear some of you snickering). That does not mean I stopped after the first bite. No, I usually finished what I started. I am grateful to be in a better mindset today. Do you ever feel you have to eat something just because it looks amazing? Does it help you to remember feelings are not facts? Just looking at the cupcakes got my saliva flowing. I was thinking before I read your post that I would select "Snuffy" because I loved him when my daughter watched the show. 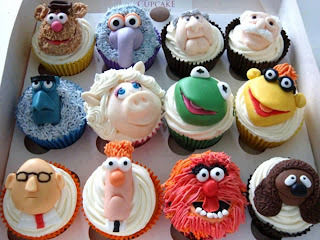 Then I thought I should have picked "Miss Piggy " because that how I felt looking at the cupcakes. I have given up sugar, so I would just walk away. I don't have to chose one because they are offered. I've never even gone to our cupcake shops. And I hardly ever bake desserts anymore. I did consider buying a very cute enamel cupcake necklace, but my teen daughter says, You wearing that doesn't even make sense." So I didn't. All of that is involving a 2nd or 3rd party/thing. cupcakes did not look appealing, frosting looked nauseating. none: sugar is all forms is poisonous. Once I learned that, I had no more issues eating sugar. I work in an office where people constantly bring in sweets. I'm glad to say I could pass these up. If it was ice cream, not so much. Ditto Vickie- except the frosting was a huge binge item for me. I distinctly remember telling myself in April 2011 , about 2 years ago- well, I'm 45 and I've tasted all the cupcakes/frosting I've ever need to taste, now I need to live a different life and taste regular food. In my mind's eye, I could see not celebrating birthday's with cake. I identify with Mary Ellen's comment on ice cream.It is very hard for me to say no to ice cream. I have learned the hard way. Attitude is everything. When we change your attitude we change our behaviors. We change our lives!